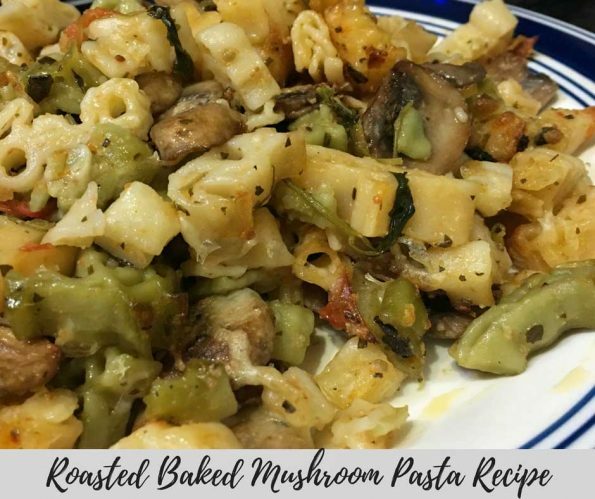 This baked mushroom pasta recipe is an easy homemade baked vegetarian mushroom pasta recipe from scratch where we only use the fresh and fine ingredients to make the dish from scratch. 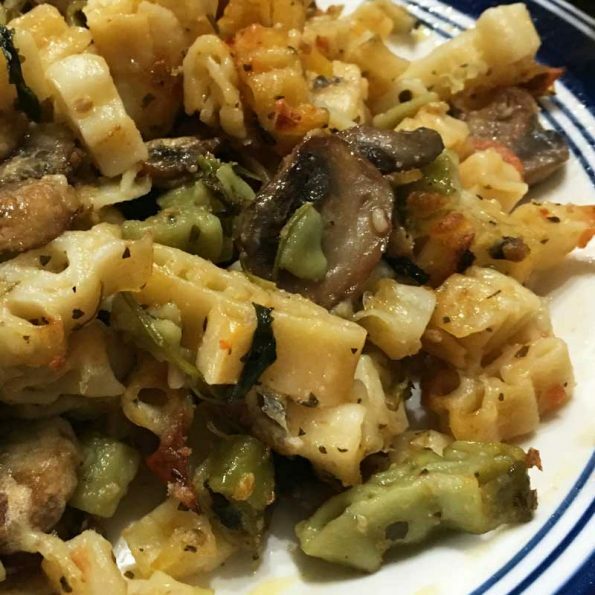 I used button mushrooms in this baked mushroom pasta recipe and I also used the wagon wheel shaped pasta, but you can use whichever pasta shells you like. 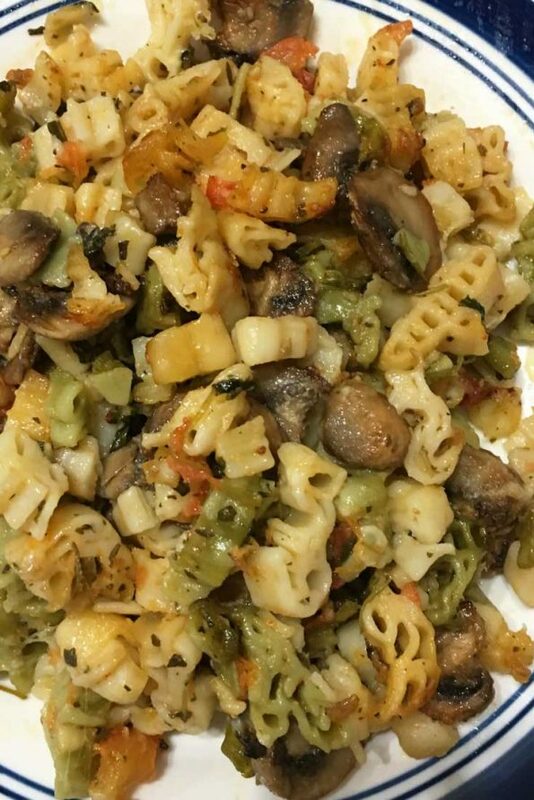 I actually used the wagon wheels pasta with colorful shells, which I cannot find online now, but I am sure the plain wagon wheels pasta or any other pasta shells of your choice would just turn out fine! 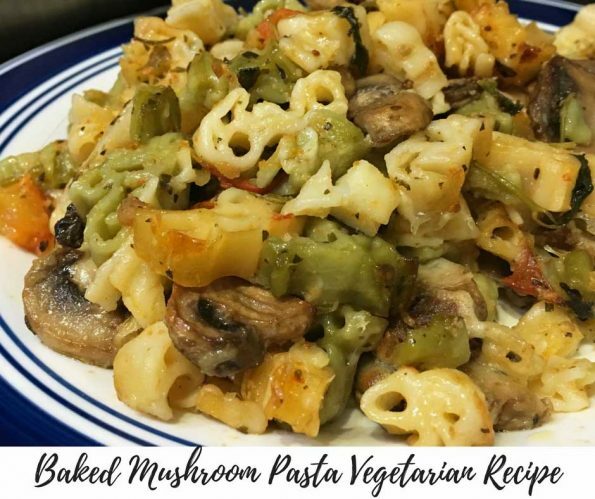 This basked mushroom pasta recipe is vegetarian but not vegan as we use butter to flavor the dish which makes it really delicious and adds much flavor. Adding cheese is optional, but you can add cheese to the pasta if you wish, although I only used a bit of cheese just to add some more flavor, but adding cheese is not at all necessary and you can make this without cheese and it will still be very delicious. We use tomatoes to make fresh sauce which will be added to the pasta and we roast the mushrooms in butter and little milk, before we mix it with the cooked pasta in homemade tomato sauce and bake the whole thing. As we bake the pasta mixed with buttery mushrooms the flavor increases much and you will really love it without even adding any cheese. So here is how you can make this delicious mushroom pasta following this baked mushroom pasta recipe from scratch. Homemade baked mushroom pasta makes a delicious vegetarian lunch or dinner! Cook the pasta according to the package directions with enough water and salt, drain the water after the pasta is cooked. I recommend not cooking the pasta until very tender as we will bake this so it gets cooked again. Add a tablespoon of olive oil to the cooked pasta and mix well, so the pasta shells won't stick together, keep this aside. Wash the tomatoes and chop it in small sized pieces (we do not remove the seeds of the tomatoes here, you may also use fresh marinara sauce instead of preparing the tomato sauce from scratch). Heat 2 tablespoons of olive oil in a pan and add the chopped tomatoes. Add the salt, garlic powder and crushed ginger, saute for 2 to 3 minutes. Add the chopped cilantro leaves and dried oregano flakes, saute for another 2 to 3 minutes in medium heat. As the tomatoes get cooked, you can see that the tomato pieces turns soft and the fresh sauce is formed which combines with the flavor of the spices and cilantro leaves. Cook the tomato sauce for another few minutes until the sauce starts separating from the oil. Add the prepared tomato sauce to the cooked pasta, mix everything well so the sauce will mix up with the cooked pasta shells. Keep this aside closed. In a pan, heat the butter and add the mushrooms. Saute the mushrooms for 2 to 3 minutes and the you can see the mushrooms will start releasing the water content. Reduce the heat, add salt and more garlic powder (extra 2 teaspoons of garlic powder) and cook in low heat for another 3 to 4 minutes. Add the 2 to 3 tablespoons of whole milk to the mushrooms and mix well, cook in low heat for another 2 minutes, stirring frequently so the milk won't burn at the bottom of the pan. Transfer 3/4th of the prepared mushrooms to the cooked pasta in sauce, stir everything well so the roasted mushrooms gets mixed up well with the cooked pasta in sauce. Prepare a baking pan (a casserole dish would work well) and transfer the pasta to the baking pan. If you are using cheese, you may add a layer of pasta to the pan, add a layer of shredded cheese and then add the remaining half of pasta in another layer. Now top the pasta with the remaining 1/4th of roasted mushrooms in a single layer. Bake the mushroom pasta for 2 5 to 30 minutes or until the top of the pasta starts to turn light golden brown in color. At this point, you may add a little more shredded cheese on top and bake for another few more minutes if desired. Serve the delicious baked mushroom pasta for a delicious vegetarian lunch or dinner! 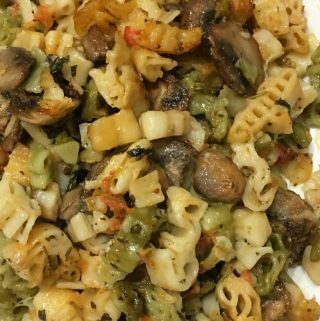 Hope you found this post on baked mushroom pasta recipe from scratch helpful in making easy and yummy baked mushroom pasta from scratch.